A geomorphologist and field geologist by training, Levy recently worked with what he calls an international dream team of scientists to explore the intensity of permafrost thaw and glacier thinning in the Mcmurdo Dry Valleys of Antarctica. The research, funded by the National Science Foundation, used a flying laser scanner, also known as a lidar, to map the current topography of the frigid region and compared the data to a NASA scan of ground elevation taken in 2001. While many scientists previously believed that parts of Antarctica were locked in a deep freeze and largely unaffected by global climate change, Levy’s team found that millions of cubic meters of buried ice, previously trapped in permafrost, has now thawed. His team also found evidence of glacier thinning, deepening of Antarctica’s handful of lakes, and places where the ground had collapsed due to rapid thawing of buried ice. The new lidar data shows geological deposits needed to interpret past climate change from the ice ages and can also be used to predict how climate will change in the future. These landforms are locked in the fast-melting ice of Antarctica, and so the disappearance of once-buried ice poses threats to the clues that scientists have traditionally relied upon to piece together how quickly ice sheets have collapsed in the past. Levy noted that the melting detected in this study is a symptom of climate change, and it is only the first wave of thawing for Antarctica. 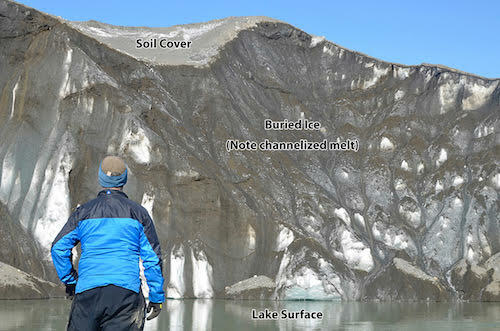 To learn more about Levy’s research, read his work “Decadal topographic change in the McMurdo Dry Valleys of Antarctica: Thermokarst subsidence, glacier thinning, and transfer of water storage from the cryosphere to the hydrosphere,” recently published in Geomorphology.